A new Dimension Police G Guardian and Heal Trigger appear, that Counter Charges cards. 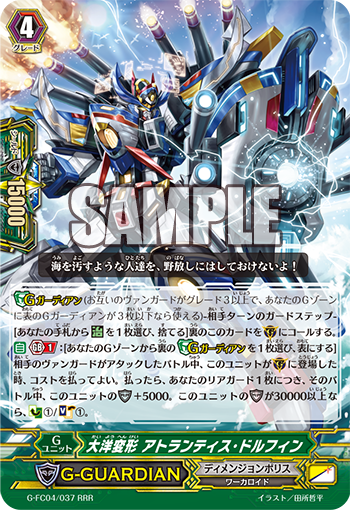 AUTO Generation Break 1: [Choose 1 face-down G Guardian from your G Zone, flip it face-up] During a battle in which your opponent’s Vanguard attacks, when this card is placed on (GC), you can pay the cost. If you pay it for each of your Rear-guards, during that battle, this unit gains Shield+5000, and if this Unit’s Shield is 30000 or more, Counter Charge 1/Soul Charge 1. AUTO: [Soul Blast 1] When you discard this card from your hand for the cost of Calling “Ocean Transformation, Atlantis Dolphin” from the G Zone, if you have 4 or less face-up cards in your Damage Zone, you can pay the cost. If you pay it, Counter Charge 1. For Today’s Card, we’re introducing the following from “Fighter’s Collection 2017” (on sale May 12th, 2017): The Generation Break 1 《Dimension Police》 G Guardian, “Ocean Transformation, Atlantis Dolphin” and the Heal Trigger “Saving Dolphin” that activates its ability when it’s discarded from the hand for the Cost of Calling the related G Guardian. When “Ocean Transformation, Atlantis Dolphin” is placed on the field, for each of your Rear-guards, it gains SHield+5000. And if its Shield is 30000 or more, you can Counter Charge 1 card and Soul Charge 1 card! If you have 3 ally Rear-guards, you’ll be able to achieve a Shield of 30000 or more, meaning the conditions are strict. With 5 Rear-guards, you’ll have a 40000 Guard, meaning you’ll be able to defend against an opponent’s super powerful attack. Besides solid protection, it’s a reliable G Guardian you can trust to recover costs as well. Continuing with our introduction, there’s “Saving Dolphin”, who can activate its ability when discarded from the hand for the Cost of Calling “Ocean Transformation, Atlantis Dolphin”! If you have 1 or more face-up cards in your Damage Zone, you can pay 1 Soul Blast. It’s a handy Counter Charge ability for 《Dimension Police》. That way, next turn, you’ll be able to secure the cost of things like the Stride Skill of “Bravest Rush, Grandgallop”, so aim to activate it when you need to Counter Blast. Q. Can you discard “Saving Dolphin” for the Cost of Calling G Guardians other than “Ocean Transformation, Atlantis Dolphin”? Q. Can you Call “Ocean Transformation, Atlantis DolphinWitch Queen of Sin, Yelidd” while you have no face-up G Units? Q. When there are 3 face-up G Guardians in your G Zone, can you activate the effect of “Ocean Transformation, Atlantis Dolphin” by flipping a G Guardian face-up?